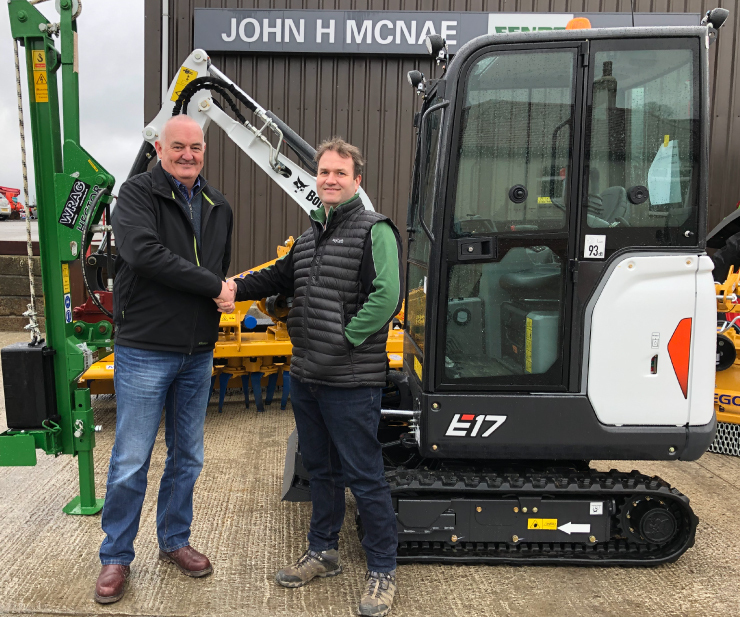 We’re pleased to announce the appointment of Gary Whyte as our new sales representative for agricultural and construction machinery sales across North Ayrshire, Lanarkshire and the Central Belt. From a farming background, Gary brings 18 years of agricultural sales experience to the business and is looking forward to meeting existing customers and welcome new customers to help to continue to grow the business. Mobile 07506 548088 or email gary@mcnae.net. We have been advised today (28th September) by Kuhn Machinery that they will not be renewing our contract with them. This is an unexpected bolt from the blue, however we will continue to service all Kuhn machines we have supplied. We can assure you that the experience and training our engineers have accumulated over these last eight years will still be available to our customers. Our Krone franchise covers a wide range of forage and grassland equipment to supplement the loss of Kuhn. This alongside our other partners will still allow us to offer competitive premium products in the future. 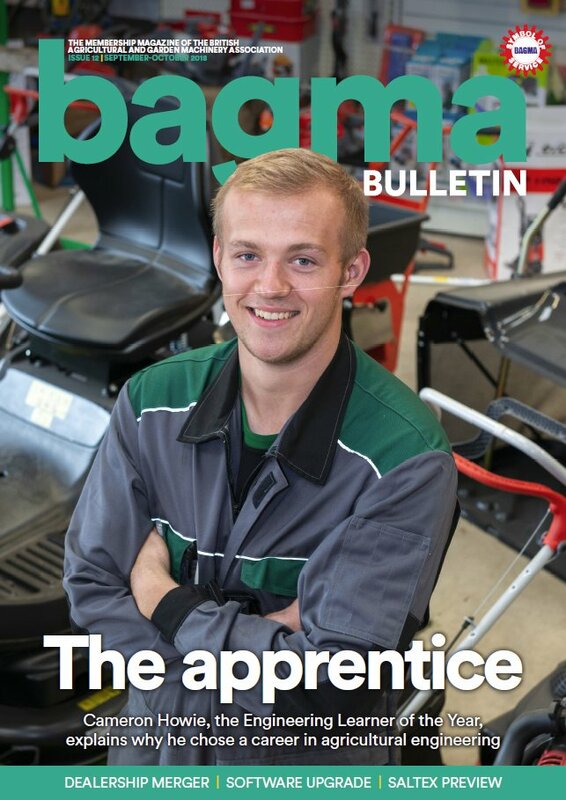 Great article about our apprentice engineer Cameron Howie in the latest edition of Bagma Bulletin. Well done Cammy on your much deserved award! 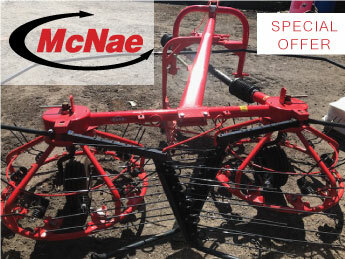 Special clearance offer only one remaining. 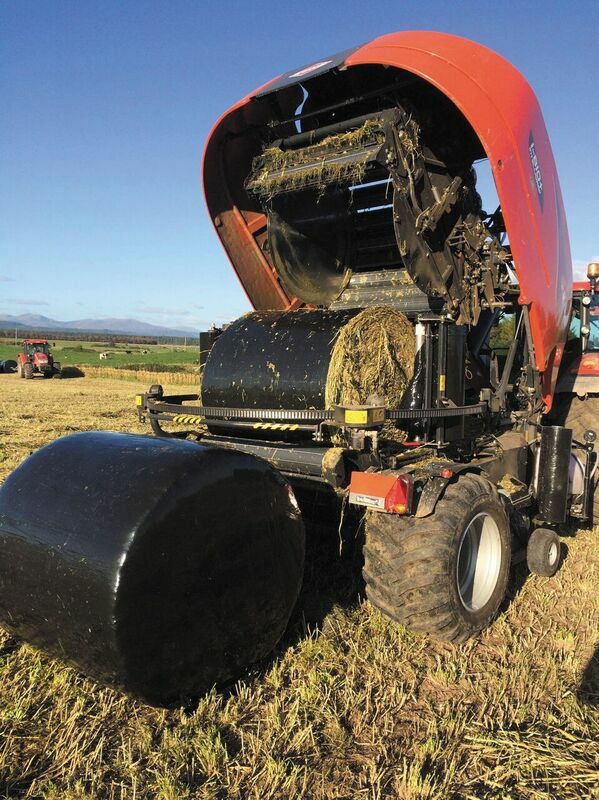 Big bale grass silage is proving to be the best complementary forage for a zero-grazed dairy herd, as Jennifer Mackenzie discovered. 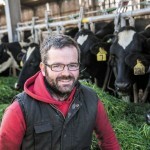 Maximising milk from forage to maintain margins with low milk prices has been the overriding aim of a Dumfries and Galloway family farming partnership. The Marshalls have been dairying at West Kirkland Farm just outside Wigtown since the 1940s, and husband and wife team Alan and Valerie’s son Neil is the third generation of the family to farm there.Alan and Neil are jointly responsible for all the management decisions on the farm and most of the day-to-day work while Valerie, a retired teacher, looks after the calf rearing and youngstock management. Neil’s girlfriend Caroline also works full-time on the farm and does the majority of the milking, along with one other full time employee. The dairy herd has been increased over the last decade to 300 Holstein-Friesian milkers plus followers, which are crossed to either Holstein or Norwegian Red bulls, and milked twice a day on a year round calving pattern.The Marshalls farm 350 acres spread over three sites and more than two-thirds of the ground at West Kirkland is heavy clay, making it challenging for grazing cows, particularly in a wet year. The majority of the 350 acres are in grass, apart from 36 acres for spring wheat wholecrop. A decision was made in June 2015 to zero graze the milking herd and two second hand machines were bought. This year the milkers have been housed day and night from April until November, depending on weather conditions and grass availability.“We needed to find a way of saving money and improving margins with a reduced milk price,” said Neil.Around six or seven acres of fresh grass is cut once daily and the summer ration has been 95kg of fresh grass with 10kg of this year’s first cut baled silage (31% dry matter, 15.6% crude protein, 11.6MJ/kg ME and 71.8% D-value). Silage was introduced at the end of August to help maintain dry matter intakes and prevent running short of grass. When only fresh grass was being fed, cows were consuming a fresh weight of up to 112kg/day. A 16% protein dairy cake is fed through the parlour according to yield at a rate of 0.4kg/litre. Cows are currently producing M+15 litres from forage. At the beginning of the season, M+20 litres was being achieved from grass, this dropping to 17 litres in June.At the beginning of September, a partial TMR ration was introduced as grass quality declines and additional protein and concentrate is required to maintain yields. The herd is averaging 8,200 litres at 4.4% butterfat and 3.4% protein. Throughout the summer the herd has been producing 25l/day, which is slightly below previous years’ performance. However, buffer feed has been reduced this year as a cost saving exercise. The zero grazing takes around two hours a day over 30 acres at a time and as long as the season allows – hopefully to early November this year. When the grass ‘gets away’, opportunistic cuts are taken and baled for silage, producing 20 to 30 bales at a time. The Marshalls use a Kuhn iBio combination baler/wrapper, which has the capability of applying wrap on wrap, avoiding the need for netting. With their system, they wanted a machine that they could use themselves when required without needing to involve contractors.“We liked that the machine did everything in one – baling and wrapping,” said Neil. 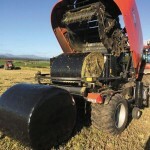 “The two layers of wrap make a very tight bale which is evident because it is noticeably about three inches smaller than a conventionally wrapped bale with net.”Alan added: “The machine is lightweight – 3.5 tonnes – which not only helps minimise ground damage but it means we can use it with a 120hp tractor. It also means that we can do a field easily and the bales are wrapped and just ready to be picked up.”The Marshalls have also noticed that the tight wrapped bales are less likely to be attacked by birds.The baler-wrapper has also been used for the wholecrop wheat grown on around 40 acres a year and undersown with a long-term ley grass mix including clover as part of the re-seed policy.The Kuhn wrap on wrap system produces a tight, well-sealed bale, minimises risk of bird damage and makes disposal of used wrap easier. 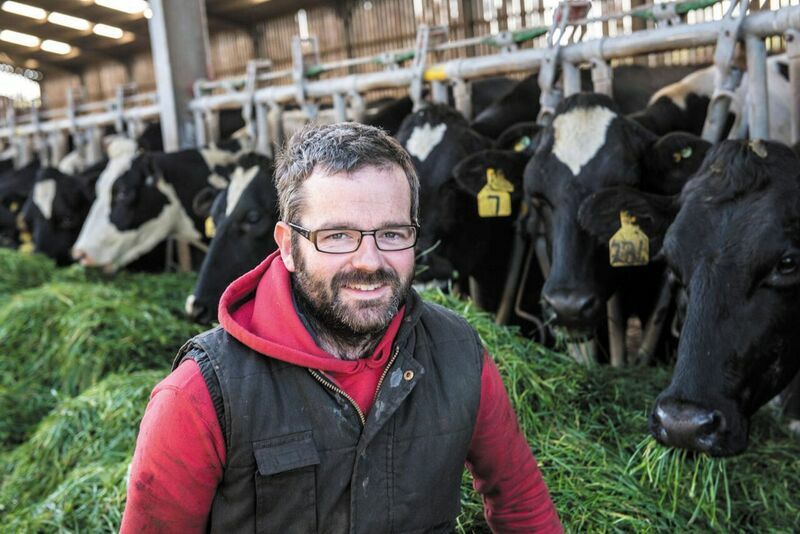 Zero grazing is working for Neil Marshall as they strive to increase milk from forage.